* Use of Battery Check function is optional and for convenience only, it is not intended as a substitute for checking the unit on a known live source before and after use. I purchased the 117 based on reviews and the Fluke reputation; it is my third digital multimeter and second Fluke (the other is a clamp DMM I use mostly for testing amperage). Despite the ambiguous complaints posted by others, this is a solid multimeter. The large 6,000 count display makes the meter easy-to-read and understand; as long as you are looking directly at the screen. My only (minor) complaint is if the screen is looked at - even slightly - from above, the digits disappear, but for me this is only a minor inconvenience. The meter feels solid and robust in the hands and not easily damaged. The non-contact voltage sensor is very sensitive, especially when set to "HI", which makes it ideal when checking for electrical wires inside of walls. I have zero "buyer's remorse" and will use this meter for a long time. 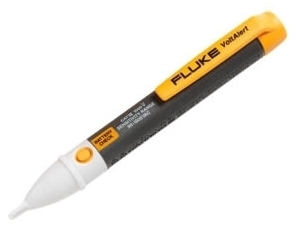 I have used the 2-AC non contact voltage tester for over ten years. Even after repeated drops and bumps they keep on working. I have never had one that didn't detect voltage when there was voltage in the circuit. Sometimes the tester shows voltage when there is none but that just means I need to double check with my meter- which happens to be the fluke T+Pro electrical tester. It's a tough pair to beat.